Soroori, S., Ahrari Khafi, M., Bahonar, A. (2009). Effects of Low-Dose Recombinant Human Growth Hormone on Bone Densities of Radius, Tibia and 4th Lumbar Vertebrae in Rabbits. Iranian Journal of Veterinary Surgery, 04(1-2), 9-18. Sarang Soroori; Mohamad Saeed Ahrari Khafi; Alireza Bahonar. "Effects of Low-Dose Recombinant Human Growth Hormone on Bone Densities of Radius, Tibia and 4th Lumbar Vertebrae in Rabbits". 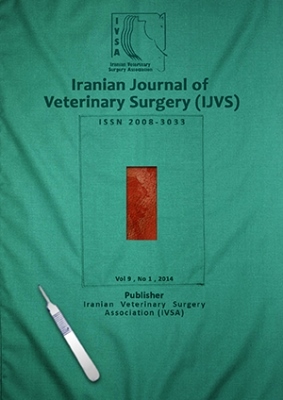 Iranian Journal of Veterinary Surgery, 04, 1-2, 2009, 9-18. Soroori, S., Ahrari Khafi, M., Bahonar, A. (2009). 'Effects of Low-Dose Recombinant Human Growth Hormone on Bone Densities of Radius, Tibia and 4th Lumbar Vertebrae in Rabbits', Iranian Journal of Veterinary Surgery, 04(1-2), pp. 9-18. Soroori, S., Ahrari Khafi, M., Bahonar, A. Effects of Low-Dose Recombinant Human Growth Hormone on Bone Densities of Radius, Tibia and 4th Lumbar Vertebrae in Rabbits. Iranian Journal of Veterinary Surgery, 2009; 04(1-2): 9-18. 2Department of Clinical Sciences, School of Veterinary Medicine, Shiraz University, Shiraz, Iran. 3Department of food hygiene and quality control, Faculty of Veterinary Medicine, University of Tehran, Tehran, Iran. Objective- To determine the effects of growth hormone (GH) therapy on bone density in controlled conditions in healthy adult rabbits. Design- Experimental in vivo study. Animal- 20 healthy, adult New Zealand White rabbits. Procedures- The rabbits were divided into 2 groups; receiving Human GH (0.006 mg/kg/d) and controls; receiving placebo for 3 months. The density of radius and tibia was measured in the proximal epiphysis, mid shaft and distal epiphysis while the density of vertebral column was measured in the fourth lumbar vertebra (L4) using aluminum step-wedge and appropriate software. Measurements were performed in 5 stages, one before the start of therapy and 4 times after the administration of GH or placebo, with 3 weeks interval. Results- The mean level of serum insulin-like growth factor I (IGF-I) was increased significantly after GH therapy (p<0.05) in the test group (222 ± 51 vs. 270 ± 64 ng/l). The mean level of IGF-I did not change significantly in control group. Densitometric measures in mid shaft of radius was increased significantly in test group after GH therapy while it did not have any significant variation in control group (p<0.05). Conclusion and Clinical Relevance- The difference between the long bones and vertebrae in terms of GH responsiveness is similar to what was reported in human acromegaly. Decrease in density in the second stage in some regions that followed by increasing in the next stages was similar to what was reported in treatment of patients with growth hormone deficiency (GHD). This study suggests that rabbits might be a useful model to assay GH effects on bone density in acromegaly, GHD, or healthy human adult.